OJSC «Mobile Energy» (a part of the holding company «RAO ES of the East») started the construction works on installing a wind-diesel complex in the Commander Islands in the village of Nikolskoye. The complex includes two wind power installations, with the capacity of 275 kilowatts each. The launch of wind turbines is scheduled for late September. The project has already received a positive assessment of the State expert assessment department. So far sites for the wind power installations have been prepared, the necessary equipment have been delivered, including the wind turbines. Additionally, the automatic control system will be delivered to the island. The total project cost is 112 million rubles. For the construction of wind power stations the unique wind turbines were chosen – the wind generators produced by Vergnet, France. Their installation does not require heavy-duty cranes. The assembled complex is raised by means of its own hydraulic winch. To lower the machine to the floor takes only two people and less than 1 hour. 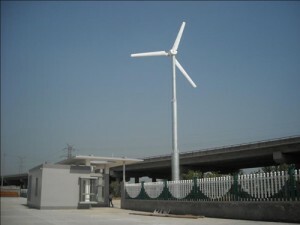 Similar wind turbines are widely used in the islands of the Pacific, Europe, Australia, Asia and Africa. Wind-diesel systems will be operate by JSC Southern Power Grids of Kamchatka – the subsidiary of Kamchatskenergo (a part of RAO ES of the East), as the main supplier of heat and energy in remote areas of the Kamchatka region. The long-term plans (up to 2016) of OJSC «Mobile Energy» and JSC «SPGK» include the construction of wind-diesel complexes in Ust-Kamchatsk with the installation 11 wind power turbines, 11 wind turbines are scheduled to be installed as a part of the wind-diesel complex in Tilichiki, in Ossory, Manila, Pakhacha 5 wind turbines are to be installed, Palana is to obtaine 7 wind turbines. It should be noted that according to the design calculations up to 45% of the «diesel» power in Kamchatka will be replaced by «the wind» power. Due to dumping of surplus electricity of the WPP to the electric boiler the amount of fuel for the boiler will also be reduced. Besides, the level emission of harmful substances into the atmosphere will also be lowered. The activities to implement wind diesel complexes in Kamchatka started back in 2010, when the wind-measuring complexes were installed in the towns of Tilichiki, Ossora, Palau, Ust-Kamchatsky, Tigil to determine their wind potential. So far the collected data prove a high efficiency of the use of wind power equipment in the power isloated areas of Kamchatka.